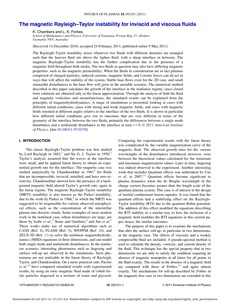 The Rayleigh–Taylor instability arises whenever two fluids with different densities are arranged such that the heavier fluid sits above the lighter fluid, with a sharp interface in between. The magnetic Rayleigh–Taylor instability has the further complication due to the presence of a magnetic field throughout both media. The two fluids in question may also have differing magnetic properties, such as the magnetic permeability. When the fluids in consideration are in fact plasmas comprised of charged particles, induced currents, magnetic fields, and Lorentz forces can all act in ways that will affect the stability of the system. Stable base flows exist for the 2D case, and small sinusoidal disturbances to the base flow will grow in the unstable scenario. The numerical method described in this paper calculates the growth of the interface in the nonlinear regime, since closed form solutions are obtained only in the linear approximation. Through the analysis of both the fluid and magnetic vorticities and streamfunctions, the simulated results can be explained from the principles of magnetohydrodynamics. A range of simulations is presented, looking at cases with different initial conditions, cases with strong and weak magnetic fields, and cases with magnetic fields oriented at different angles relative to the interface of the two fluids. It is shown in particular how different initial conditions give rise to outcomes that are very different in terms of the geometry of the interface between the two fluids, primarily the differences between a single mode disturbance and a multimode disturbance to the interface at time t = 0.